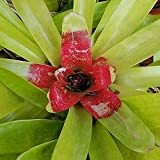 Neoregelia carolinae growing leaf plant bromeliads of the genus Neoregelia also known as Blushing Bromeliad, Neoregelia carolinae perennial evergreen used as ornamental plant, can grow in subtropics, mediterranean, tropic climate or as houseplant and growing in hardiness zone 11+. Leaves color can be: green, pink, white, yellow, red and mostly more than one color, can be different patterns to the colors, with darker line in the middle, leaf linear and sharp in the edge, leaves grow in rosette structure. Flower color purple or pink, the flowers grow in the inner part of the plant.